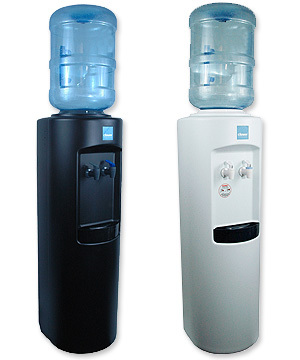 We are proud to offer the general public a water cooler with true commercial-grade construction and a classic, contemporary design. The Clover B7B Commercial Grade series provides you with the same heavy-duty framework and internal hardware of the high-end coolers traditionally leased and sold through by professional water delivery companies, but at a significant cost savings. While they are durable enough to withstand years of abuse and heavy traffic, they also have a sleek, modern design that fits perfectly into any home or office dï¿½cor, and a whisper-quiet running sound that will ensure they go unnoticed except when they are in use. Start enjoying room temperature or chilled water for drinking at your fingertips with the Clover B7B. This quality water cooler includes a full internal steel frame and a UV protected, high density polyethylene outer shell that is not only durable but easy to clean. The B7B features a hygienic stainless steel water tank. It comes with a no spill top for easy pour 5 gal bottles, and a patented leak guard to keep your floor safe in the case of a leaky bottle. The one piece ABS drip tray is removable for easy cleaning and the entire unit is a breeze to move with a built in heavy duty metal handle on the back. The Clover B7B water dispenser comes with a cold water thermostat so you can control the water temperature to your preference. Quality Product. The product functions exactly as described. It was very easy to set up and works very well. Water Cooler Dispensers shipped the product on time and it arrived when they told me it would. I look forward to ordering from them again! - Chucky. Cape May, NJ. This exceeded my expectations. Simply the best hot and cold water dispenser we've tried. Economically priced, it arrived in good shape after travelling across the country from Colorado to New York. Everything necessary was supplied. Terrific unit after one month, no problems and no more 5 gallon bottles lying around. - A. Babbich. Los Angeles, CA.